Blue's Sim Stories: Michael Lee Harker, Intergalactic Sim of Mystery: Chapter Two - "The Incident"
Michael Lee Harker, Intergalactic Sim of Mystery: Chapter Two - "The Incident"
Despite all the joy living with Katerina brought him, Gabriel still struggled to hold his head high at work. Tales of his late-night lookouts were quickly spreading around the laboratory... and he was becoming a laughing stock. Out of all of his colleagues, only Katerina seemed willing to support him. "You must ignore them, Gabe," she told him one evening after dinner. "They are just jealous of your drive - of your ambition." Gabriel was touched by her kindness, but also felt embarrassed on her behalf. After all, they now lived together. He was worried that his associates would soon mock her as they did him, and she had done nothing to deserve it. "If... if you want me to stop..." he said, "for your sake..."
Katerina shook her head firmly. "No, my friend. If your dream is to discover aliens, then that is the goal you must work towards - and I will always support you." Gabriel smiled. 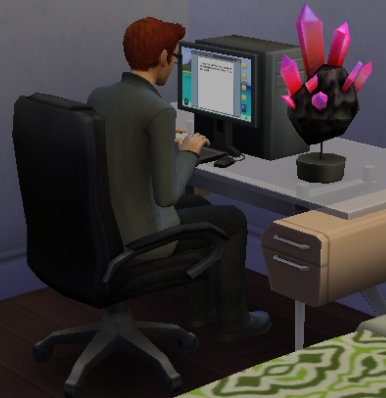 He had been truly blessed by Plumbob to find a friend like Katerina. Motivated by her words, he didn't reduce his efforts, but rather increased them substantially. Following a few trips to scrapyards and junk sites, he began work on his biggest project yet: his own personal rocket ship. If that didn't help him discover aliens, he didn't know what would. 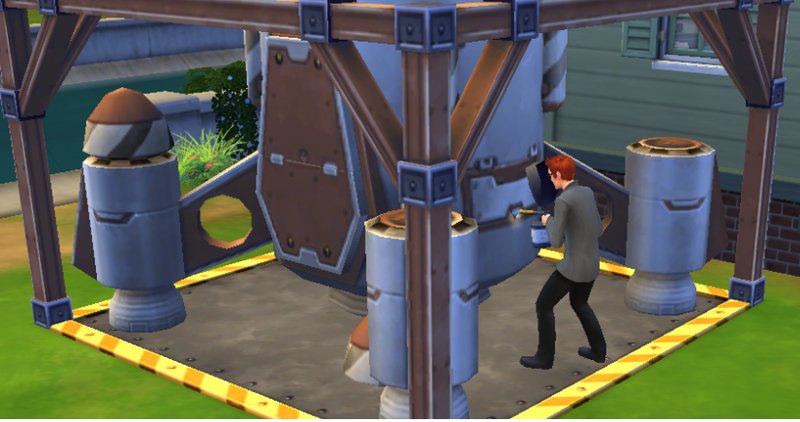 One calm, cool Friday night, Gabriel was cooped up inside his observatory, as usual. Katerina, tired after an extra long shift at the lab, had wished him a good night earlier that evening, before retiring to her room with a sci-fi novel and a cup of cocoa. Since several hours had now passed without the slightest hint of alien activity, Gabriel was now wishing he'd done the same. He half-looked into his telescope, partially bored, but mostly exhausted. A small but bright bluish-green light had suddenly appeared in the night sky... and it was getting bigger and brighter by the second. Gabriel's energy levels suddenly soared back up. Two long, lonely years of research, and now maybe... just maybe... he'd discovered something worthy of note. The light soon grew so big and bright, it became impossible for Gabriel to observe it through his telescope without blinding himself. He rushed outside, like an excited child, and cast his eyes skyward, desperate to get a closer look at the phenomenon. 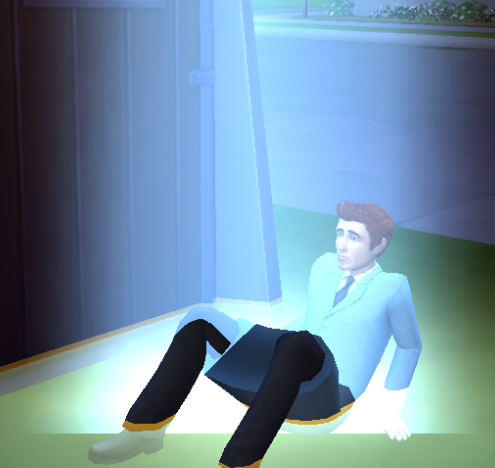 A glowing beam soon enveloped his entire body. Gabriel suddenly felt himself getting lighter and lighter - this strange source of light, this beam of energy, was picking him straight up off the ground and taking up him towards... something. After a few moments of floating, his imminent destination was revealed. Mixed feelings flooded through Gabriel's body. In a way, he was thrilled and excited, overjoyed to finally be proven right, but he was also afraid and worried. He had no idea what these aliens wanted with him. Where were they taking him? Why were they taking him? Would they bring him back? He called out to Katerina desperately, but she was too deep in sleep to hear him. 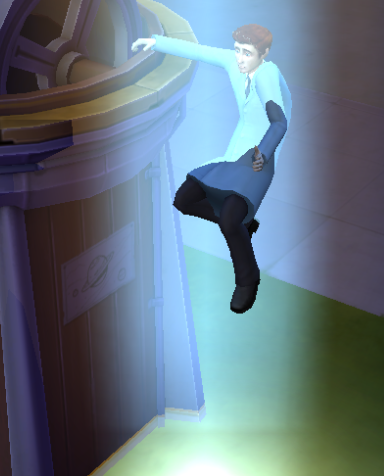 Thus, Gabriel was left to his strange fate, as the aliens took him into their craft and jetted away. Just before dawn the next day, Gabriel's new alien acquaintances bid him farewell, and gently dropped him down on the grass just outside his observatory. His memory had been partially wiped to ensure he would have no recollection of what he had seen and been through aboard the spaceship: he would recall being abducted and returned, but nothing more. After carefully clambering to his feet and dusting himself off, Gabriel sprinted into the house and entered Katerina's room, eager to share the news about what he had just been through. "Katerina! Katerina, wake up!" he called, gently grasping her shoulder to awaken her. "Aliens, Katerina! They're real! I saw them!" Katerina tossed and turned, mumbling sleepily. "You must have been dreaming," she murmured. "Go to bed, my friend." "It wasn't a dream!" Gabriel insisted. "It was real - I swear it! Wake up! I want to tell you everything!" "All right, all right," Katerina replied, yawning. "But bring me a cup of coffee first." "That's what happened, Katerina! The aliens came, took me up into their spaceship, and then brought me home." "And what happened aboard this spaceship?" "Well... that, I can't remember." "Gabriel, dear... are you sure you weren't just dreaming?" "Yes - I'm sure. This really happened. You've got to believe me!" All of a sudden, a funny, unusual feeling entered Gabriel's abdomen. His hands flew to his belly as this new sensation passed through him - a strange combination of stomachache and nausea. Katerina looked at him, concerned, as he let out a mild groan of pain. "Yes, yes... I'm fine." Gabriel replied. "I just... feel a little funny, that's all." "Well, if everything you've told me is true," Katerina said, "then perhaps your body is a little bit in shock. Go to bed now... get some rest. I'm sure you feel better in the morning." Gabriel didn't feel better in the morning. In fact, the second he woke up, the first thing he did was dash into the bathroom to vomit. The gruesome noise woke Katerina, who climbed out of bed and walked into the bathroom doorway, checking to see if her roommate was OK.
"I... I think I'm still in shock," Gabriel said to her, before immediately re-lowering his head into the toilet bowl. "I'll call work... tell them you're not coming in," Katerina replied. "You stay home - take things easy today." And so, as Katerina went off to work, Gabriel was left to lounge on the sofa, wrapped up snuggly in his bedsheets for comfort, his hands gently rubbing his still aching belly. When Katerina returned home later that evening, Gabriel didn't seem much better. He had managed to get himself washed and dressed, but he was still curled up on the sofa, half-watching some old sitcom re-run on TV. A sad, solemn expression was on his face. Katerina wore a sympathetic smile as she sat down beside her friend. "You'll feel better soon," she said, reassuringly. "I promise you." "But what if I don't?" Gabriel barked back - his blunt, uncharacteristic rudeness taking Katerina by surprise. "I have no idea what happened to me aboard that ship. I could have been infected with an alien virus, or something. What I get really ill? End up in hospital? What will I do then?" He hung his head, clearly anxious and concerned. Katerina, seeing that he needed some support at that moment, slid closer towards him, and gently placed an arm around his shoulder. "No matter what happens to you," she told him, "I will be here for you. You are my friend... my dearest, dearest friend. Anything you may now have to face, you will face with me by your side." Gabriel found tears springing to his eyes as he took in Katerina's words. Filled with gratitude, he wrapped his arms around her in a gentle, warm embrace. As Katerina retired to her room for the night, she was interrupted by a knock on the door. "It's me," called a calm, familiar voice. "May I come in?" 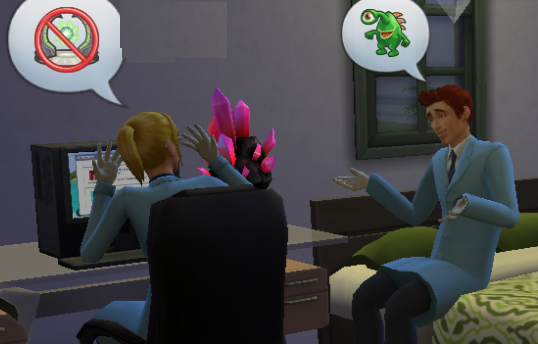 Katerina couldn't help but chuckle, knowing that the person speaking had barged into her room uninvited early that morning, eager to tell tales of alien abductions. However, she answered her visitor, letting him know it was fine to enter. She looked up at Gabriel as he stepped inside. "A little... thank you," he replied. A short pause followed. Gabriel cleared his throat before speaking again. "Katerina," he said nervously, "I... I just wanted to thank you for what you said just now, and... and I want you to know that you mean a lot to me too. Quite a lot, indeed." "Well, to be honest," Gabriel continued, "I... I suppose it would be fair to say that I... well... I..."
Gabriel's cheeks flushed red upon hearing the words he hadn't had the courage to say. Averting Katerina's gaze out of sheer embarrassment, he nodded. Katerina laughed. She ran up to Gabriel, hugging him tightly. "I love you too, you silly man," she told him, softly. Gabriel looked up at her, shocked. "You... you do?" he asked. "Yes," Katerina replied. "From the bottom of my heart." Both scientists leaned forward slowly, and in a moment of sheer bliss and magic, their lips met, and they shared their very first kiss. Despite his worries about what had happened to him the previous night, and despite the nausea and sickness he was currently suffering from, Gabriel, at that moment, was the happiest man in the world. He knew that, as long as Katerina was with him, and loved him, as he did her, then he would be able get though anything.